HOW COULD WE TOP THE BANSHEE? NEON GREEN IN STOCK - OTHER COLOURS SOLD OUT UNTIL MID-MAY! The new 16” Yoji layers huge improvements on the already solid base of what has been to date our best selling bike - the 16” Banshee. The Yoji’s new frame is constructed of formed 6061-T6 aluminum while a newly slimmed down 4130 chromoly fork handles the steering duties with compliance. Tektro mini v-brakes with miniature levers and new Brood Tenderiderz grips adorn the 22mm diamaeter alloy bars. A new forged short reach stem that can be flipped to raise handlebar height in increments in conjunction with multiple headset spacers make for an adjustable cockpit as kids grow. The Perch mini Pivotal seat from Brood Bike Co. along with an alloy post realize the holy trinity of bikes - low cost, low weight and high strength. gearing options to even the most discerning parents. Coupled with the gearing choice up front, the new Yoji also moves from our legacy freewheel and light years beyond the common coaster brake to a cassette hub with a Shimano compatible cog. Topping things off are easily the best off road tires available in this size - the exclusive 16” x 1.90” Spawn Cycles Loam Stars that we developed when no tire company was willing to make a high end tire in this wheel size. 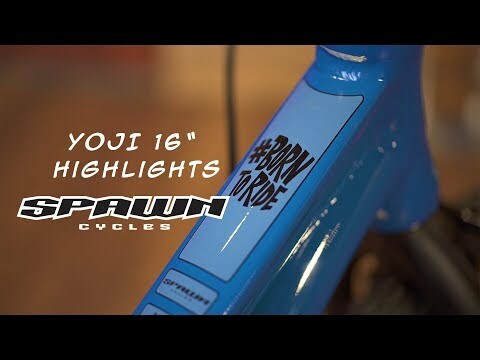 The 16” YojI comes in at a bit over 14 lbs - high end kids’ city bike weight with real off road capability. There is a reason 4, 5 and 6 year olds are getting it done with steeze on this bike!!! Not Exactly as Pictured – Our US model of the Yoji will ship with a full chainguard and a 300mm long seatpost to comply with CSPC requirements. The longer seatpost will not allow the seat height to the minimum allowable height the frame is capable of. The bicycle can be modified by the end consumer by shortening the seatpost or installing a shorter seatpost such as the 150mm Pivotal seatpost that is used on the international model. Spawn Cycles Loam Star 16" x 1.90"